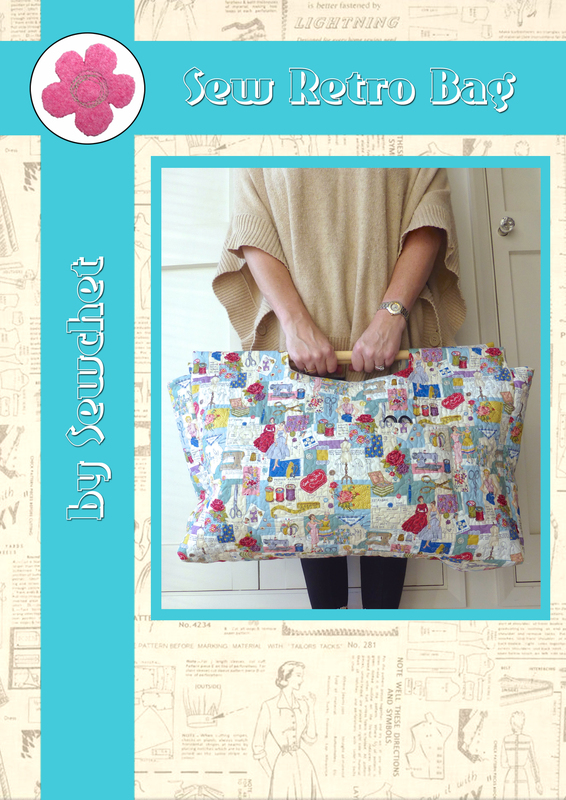 Time for another Sunday Sevens, a weekly blog series dreamed up by Nat at Threads & Bobbins. 1. 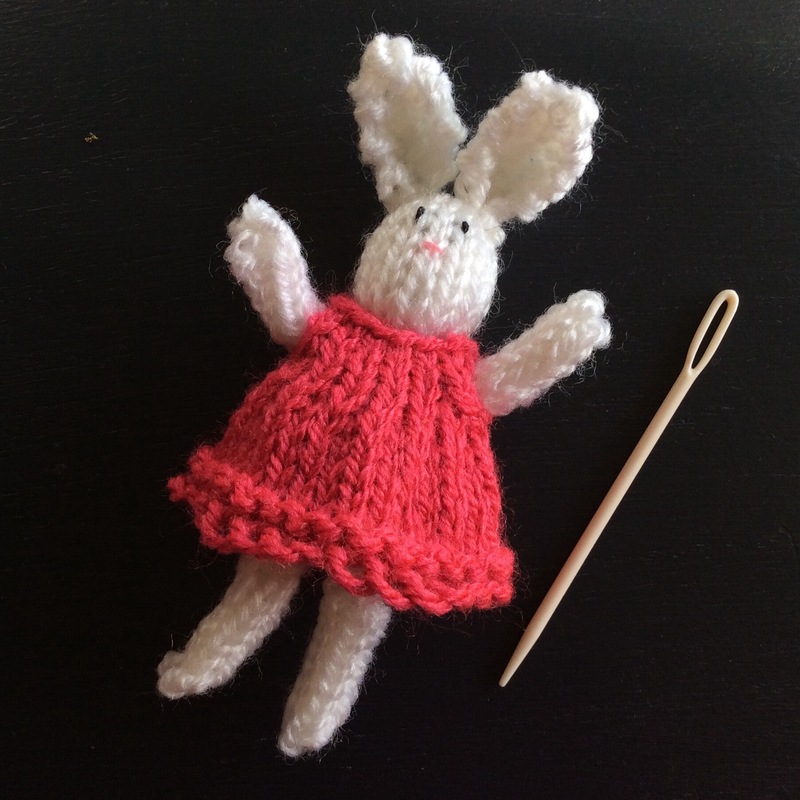 It seems mini matchbox-sized toys are ‘in’ at the moment, so I’ve made this miniature rabbit and am working on a matching mini bear as gifts for little ones. 2. 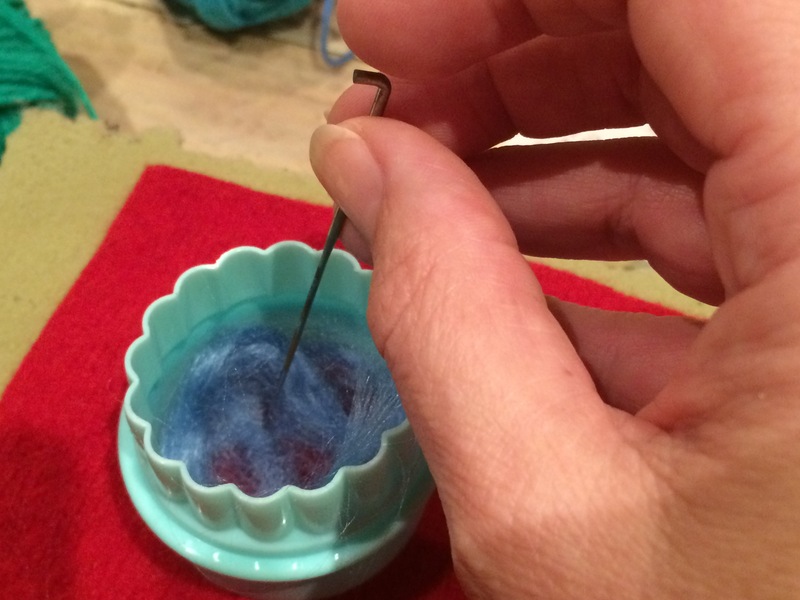 A little bit of needlefelting has been completed and will be blogged about soon. I used luxury silk tussah which shimmers in the light – beautiful! 3. A sneaky glimpse of another Stitching Santa gift, made entirely from leftover scraps of fabric and ribbon, so is a ‘free’ addition to the parcel. 4. 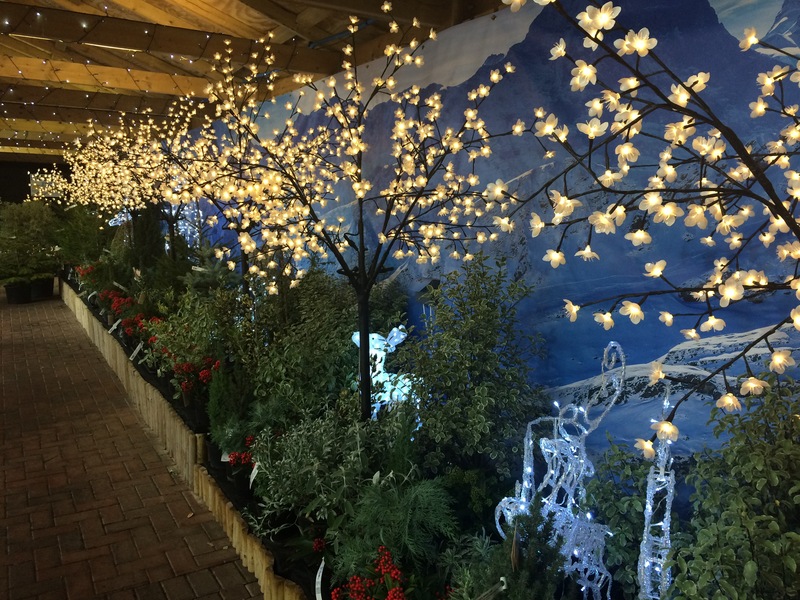 We’ve decided to invest in some of these outdoor fairy light trees for our driveway. Why the wires are only ten metres long is beyond me though, as it means we can only do the bit by the house and I had visions of a dozen trees lining the length of the driveway. 5. 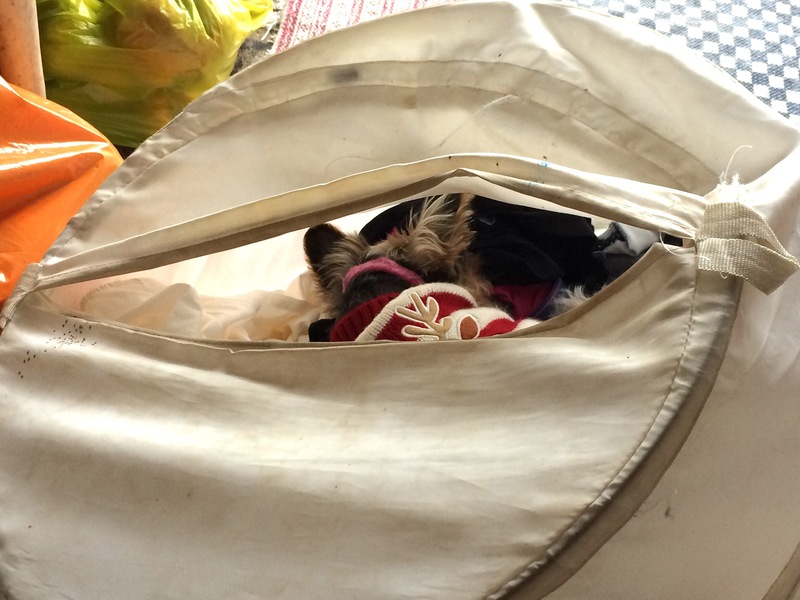 Fifi has taken to climbing inside the dirty laundry basket while we’re out, comforted by our smell, I suppose. Because she’s deaf, she can’t hear when we return, so I managed to snap this image of her still curled up fast asleep. When she first did this, we couldn’t find her at all until Tess showed us where she was! 6. 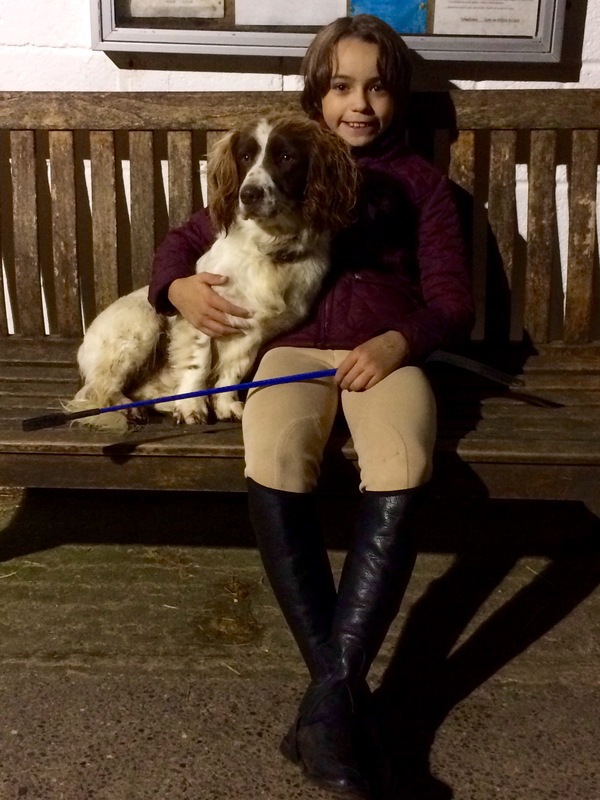 A nice pic of No.2 Son after his riding lesson, cuddled up to one of the stable’s many dogs. 8. Our 22nd annual Christmas shopping trip to Bath, and my daughter and I were joined by No.1 Son’s girlfriend this year. 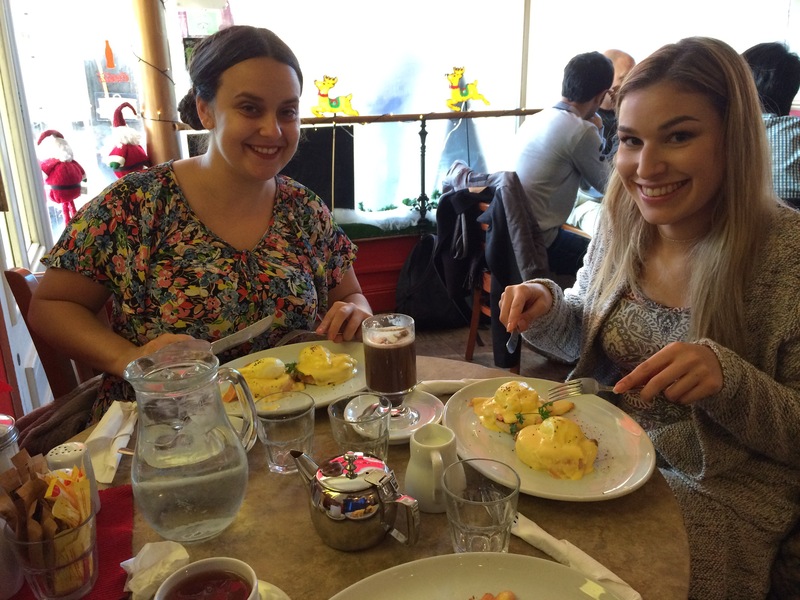 We started with Eggs Royale and Hot Chocolate Orange for breakfast. 9. 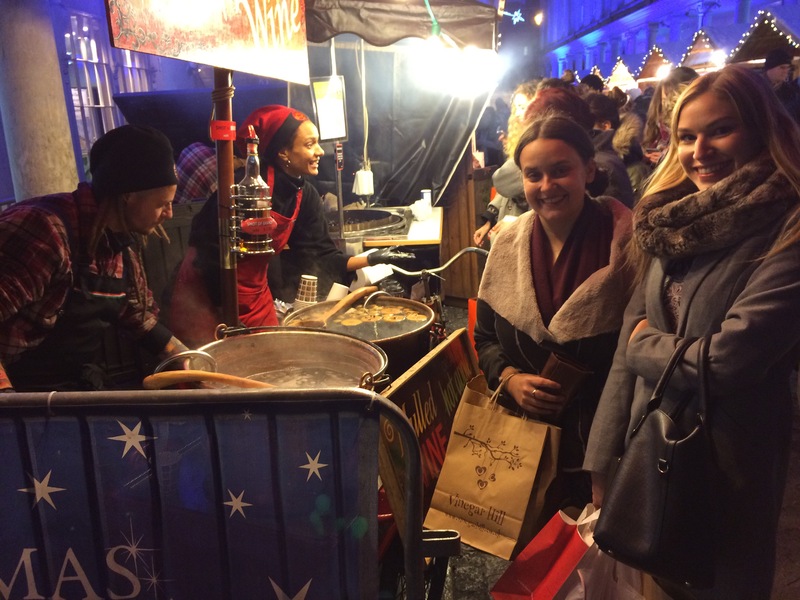 Mulled wine helped the festive shopping along…..
10. 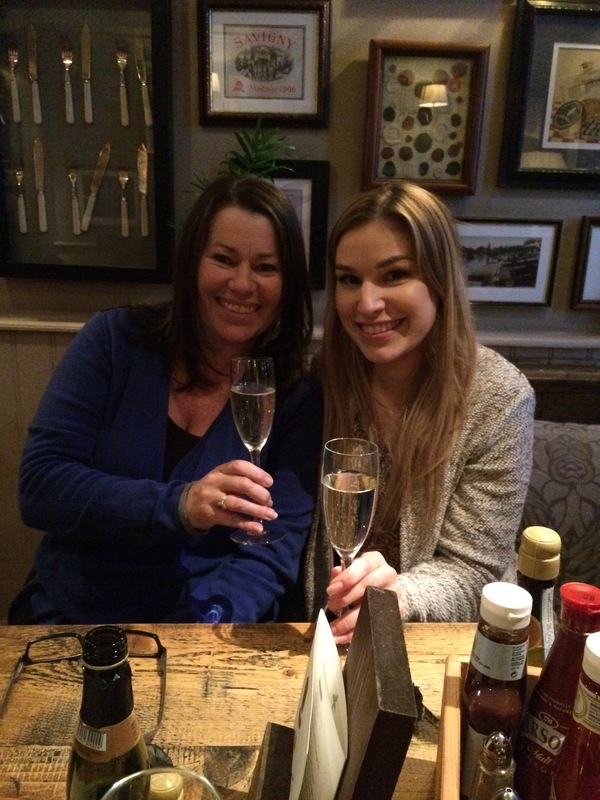 ….and Prosecco with supper in a pub finished the day off nicely. 11. 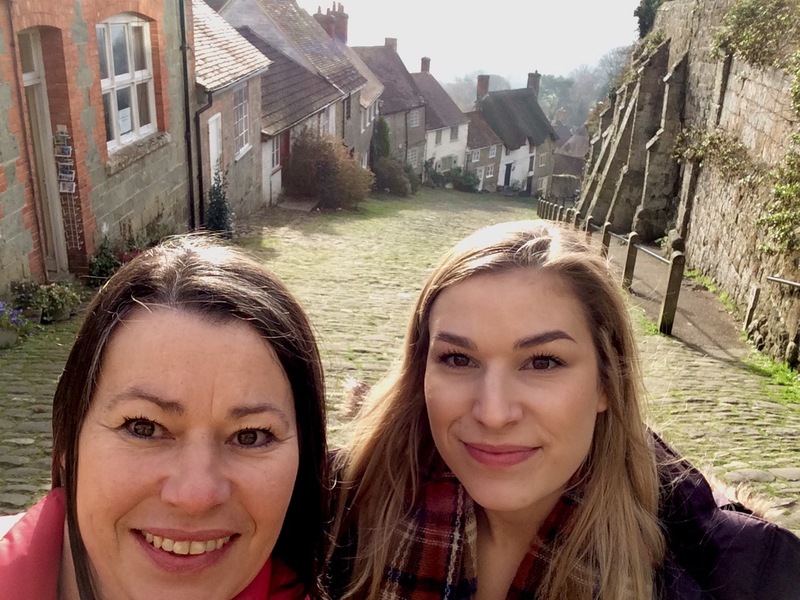 The next day, the two of us popped into Shaftesbury for an hour. You’ll recognise this view of Gold Hill from the Seventie’s Hovis advert. 12. 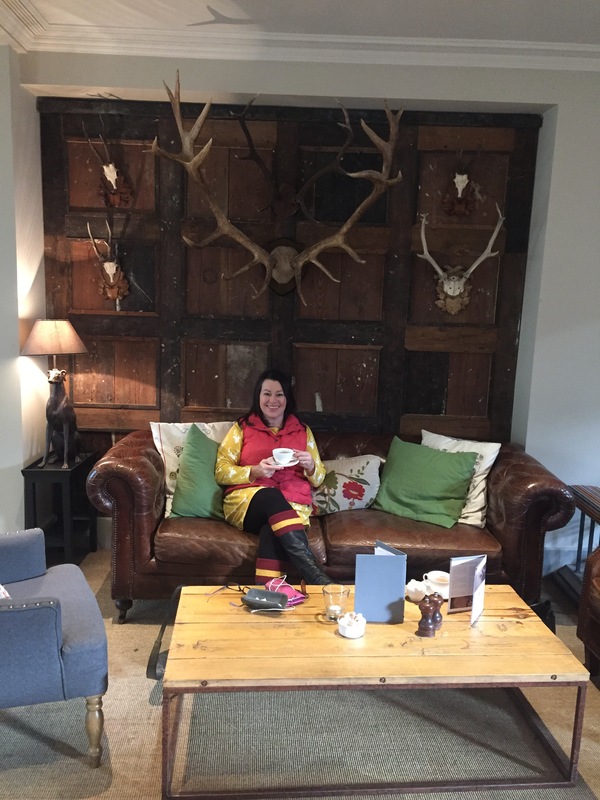 We had coffee in a hotel, where I just had to take this photo of me wearing my Stag’s head Coco dress underneath this ENORMOUS pair of antlers! 13. To top off a fab week of Christmassy stuff, hubby spoiled us both with new cars. 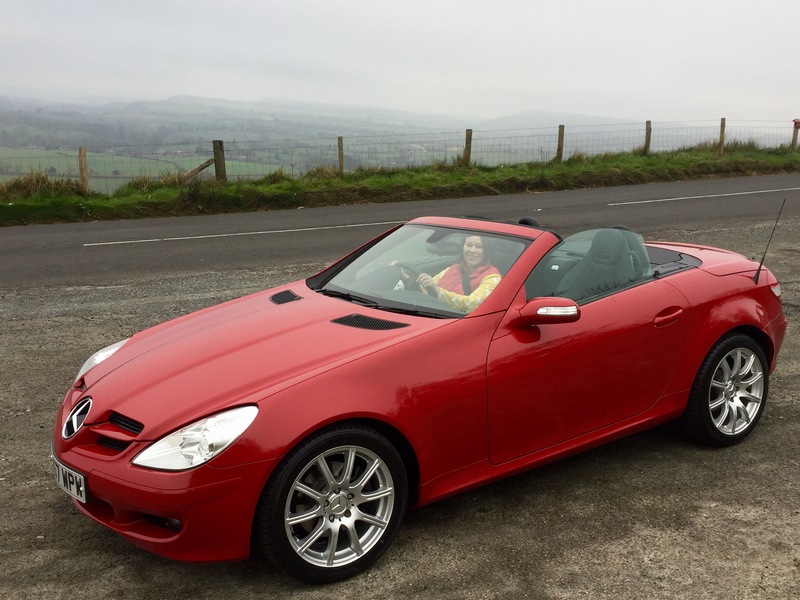 Here’s mine – a Mercedes SLK convertible and, no, the novelty hasn’t worn off yet!! Categories: Sunday Sevens | Tags: Bath, Christmas, market, Mercedes, stitching santa | Permalink. OHHHHHH. You know how to LIVE lady. 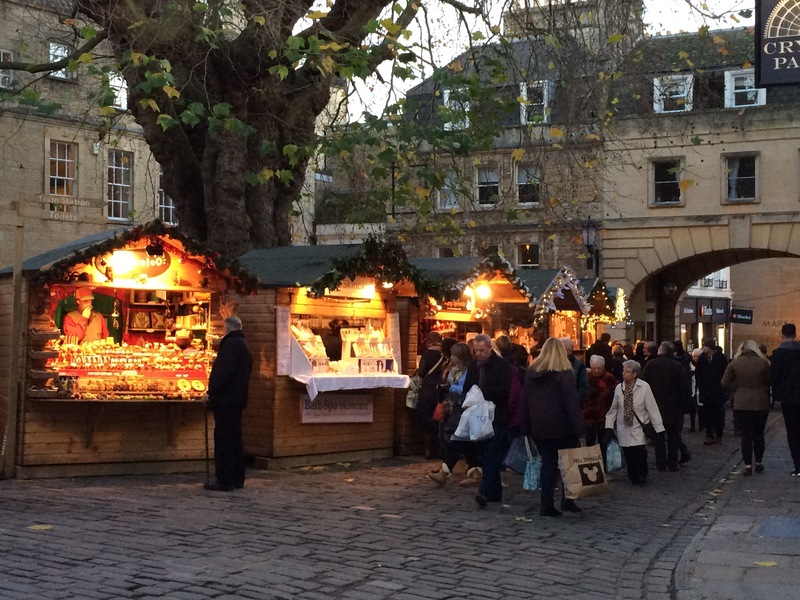 Bath Christmas market and that breakfast and dinner and the car oh my! I even adore the knitting needles roll. Your daughter looks so like you, two pretty ladies. Have a great week. 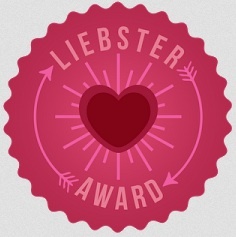 Ha ha, it was an exceptional week, I have to admit, but life IS for living after all! Holy Moly!! That sweet thing is beauuuutiful! And the car is pretty nice too. 🙂 You’ve increased my obsession with all-things-English and I just finished “Below Stairs” the memoir that Downton Abbey is based on. And I’m actually watching the series now on Amazon Prime for free. Well, as free as Prime is at $10 a month. Anyhoo…love the Shafesbury pic. I really have to get over there. And does Son #1 realize he’s subconsciously chosen a love that looks like his mom? ha She could be your daughter! Maybe soon she will be! ALL his girlfriends have looked like me!! I’ve read “Below Stairs”, too – “Climbing the Stairs” by Margaret Powell is another excellent book if you want to try it. Hope you’re enjoying the Downton series. I must look like a mad woman driving with the hood down at night, but you stay really warm and can see the stars at the same time – heavenly! Shut up. Hot air on your neck??? Really? OMG. Nice new ride friend. I love a new car, they are just so great. I always wish the smell would never go away. Love yours, suits you perfectly. Great week and round, and I loved the shopping. I have to do mine soon as well, but this week we are having a “heatwave” until the weekend, so I may just avoid the shops for a bit, way to hot. I can’t imagine a hot/warm Christmas, especially waking up to -3 degrees Celsius and a hard frost that is still here at 10.30am in November! Does that mean Christmas cards in SA have beach photos rather than snowy scenes? 🙂 It is different way of Christmas. I think I would prefer a snowy frosty Christmas though. Looks so pretty. Not that it stops us from eating just as much as everyone else. I love the picture of you with the antlers! Fabulous! Thank you – I just had to sit there in light of the fact that I was wearing my Stag dress, didn’t I? Thanks and yes, it was a particularly fun week! Thanks and I still love my dress, too, although I ought to take it off to wash it now…. Wow…What a week ~ definitely one you’ll remember for a long while 😉 How cute of Fifi to find such a comfy hideaway, thank goodness Tess was to hand to show you her new den!! Your son and the dog relaxing make a superb capture 🙂 The novelty shouldn’t ever wear off…. Enjoy!! Fifi’s so tiny that she can squeeze in a gap next to the range and crawl in behind the kickboards under the kitchen units. Those have been moments of panic, too, as she can’t hear us when we call her. As you say, thank goodness for Tess who really is her eyes and ears. Clear blue skies and a hard frost will make for a lovely drive out today with the roof down! What a fantastic week! Isn’t it amazing how the roof of the SLK fits into the boot so tidily? I had to keep checking it was there! The roof is definitely there – I know, because it’s a lot of fun just pressing the button to put it down every time I go for a drive. Which is a LOT! What a wonderful week you have had😃 Fifa looks very comfortable in her new hiding place! Thank you – she just kind of hibernates every time I leave the house and curls up on something that smells of me until I get back. Imagine what she’s like at my sister’s when we go to Spain for two weeks at a time….! Nice Christmas present! And red. Swoon! I love your little mini girl – so, so tiny! Thanks for sharing the great pictures. It’s always good to see other places. Orange hot chocolate? That sounds like something I need to know more about! Some properly festive things in this post! I particularly love the mini rabbit. She’s so cute! The little rabbit is so cute. So tiny. Girlfriend you have been a busy bee for sure. 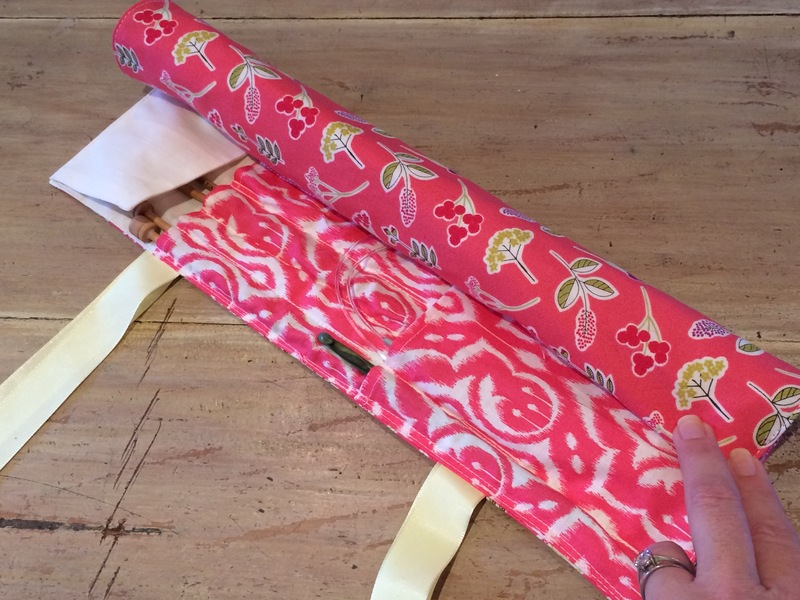 The needle case is awesome… great fabric. Nothing like a red convertible!! Hubby definitely loves his hunny. All the shopping and eating. Looks like everyone had an awesome time. I am a sucker for fairy lights. I love them. I really love all the pics.. you got some great shots. Decent new ride companion. I cherish another auto, they are just so incredible. Oh, it’s lovely – the novelty still hasn’t worn off!